Jan 24, 2019 | What Am I Reading? 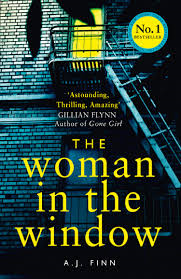 The Woman in the Window (HarperCollins 2018), the debut novel by AJ Finn, is one of those rare superstar success stories – it burst onto the literary scene and took the entire world by storm. I’m always a bit wary of whether such books will live up to the hype, but AJ Finn doesn’t disappoint. Words such as ‘unputdownable’, ‘thrilling’ and ‘astounding’ have been used, and it is certainly a psychological thriller that is a perfect example of the genre, and one that incorporates many of the literary tropes and devices that make this type of crime writing so compelling. Anna Fox suffers from agoraphobia related to a recent trauma; she hasn’t left her house for ten months. Her only visitors are her psychiatrist, her physiotherapist, her downstairs tenant (who she rarely sees), the guy who delivers her groceries and the courier who delivers her medications. She fills her days by playing online chess, chatting with an online group for agoraphobes, and drinking copious amounts of red wine. Her other hobby is watching black and white movies, thrillers of the Hitchcock genre. She has 200 DVDs and knows them all word for word. She also watches. Her neighbours fall under her daily scrutiny – she knows their habits and vices, she takes photos with her zoom-lens camera. Her large, old house (four levels, much too big for a solitary woman) is full of metaphorical ghosts and she is terrified to step outside. Her family – her husband Ed and her child Olivia – are living separately. She is terribly alone. When a new family move in across the street (the perfect couple and their adored son), she is drawn to all they seem to have that she does not; all she has lost. One evening she hears a blood-curdling scream that echoes into the night, and when she looks, she sees something that nobody was meant to witness. But when she tries to intervene, when she attempts to overcome her fear of the outside world so that she can help, not only is she paralysed by fear, but she must also deal with the outside world not believing anything she says. The police, the neighbours, her tenant – nobody believes her story. And why would they? With a history of mental illness, enough alcohol lying about to sink a ship, and a dangerous cocktail of prescription drugs, she makes for a very unreliable witness. But the question is, is she an unreliable narrator? This book takes that often-used device and stretches it to full capacity, so that by half-way through the book, we have no idea if the things she saw or did or heard actually happened, or if they are a product of her deranged imagination. But she is determined to uncover the truth, and to protect those she sees as vulnerable. We are taken along for the ride while she does so, all the while not knowing whether to trust anything she says or thinks. The book is a taut and detailed narrative of the events of a two-week period. The writing is simple, concise and easy to read. The tension is absolutely page-turning, the chapters short, the action bite-sized and thoroughly engaging. And while there are moments when the reader feels they have uncovered some of the deception, we soon realise we only know a part of the story, as the complications become even more twisted. There is a reason books such as this reach the top-seller lists, and if you are looking for a modern-day Rear Window that will keep you guessing, this is for you.